< What Does junk status really mean for SA? This page's sole purpose is to provide readers with interactive charts and graphics regarding South Africa's formal business sector. The page will be updated on a adhoc basis as more quarter's data is released by Statistics South Africa (Stats SA). The graphics and information will largely be based on the Quarterly Financial Statistics as published by Stats SA. In this update we take a look at a article published by Statistics South Africa regarding South Africa's formal sector employment numbers for the fourth quarter of 2018. 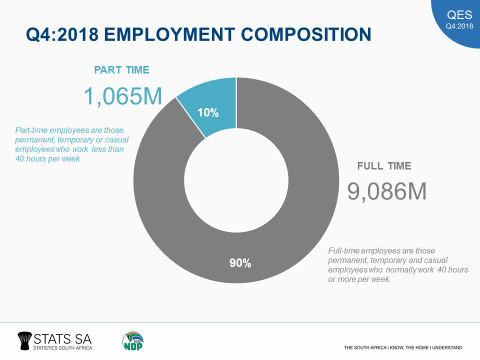 The December 2018 QES survey showed that an estimated 10 151 000 people were employed in the formal non-agricultural sector of the South African economy, which is up by 87 000 from 10 064 000 in the previous quarter. The number of people working part-time increased by 37 000 to 1 065 000 in the fourth quarter of 2018. Similarly, the number of people working full-time increased by 50 000 to 9 086 000 in the same quarter. Business services industry accounted for the biggest share of the observed increase in employment, contributing 53 000 employees, followed by the trade industry with 49 000 employees, community services industry with 9 000 employees and transport industry with 5 000 employees. However, there were decreases in employment reported by construction industry with 18 000 employees, mining industry with 7 000 employees, manufacturing industry with 3 000 employees, and the electricity industry with 1 000 employees. Employment increased by 158 000 or 1,6% year-on-year between December 2017 and December 2018, with 134 000 being full time jobs and 24 000 part time jobs. These increases were mainly in: business services (77 000 or 3,4%), trade (55 000 or 2,5%), community services (32 000 or 1,2%) , transport (7 000 or 1,5%) and manufacturing industry (5 000 or 0,4%). During the same period, annual decreases were recorded in construction (-9 000 or (1,4%), mining and quarrying (-8 000 or -1,8%) and electricity industry (-1 000 or -1,6%). R1,5 billion and mining industry with R544 million. Year-on-year, total gross earnings increased by R46 603 million or (6,9%). Average monthly earnings paid to employees in the formal non-agricultural sector remained unchanged quarter to quarter, and this amounted to R21 190 in November 2018; however annually it increased by 4,9%. So the extent of South Africa's employment problem is made clear when looking at the employment numbers above. Just over 10 million people are employed in the formal sector in South Africa, we have 4.9 million personal income tax payers in South Africa, and worryingly we have 3 million youths (between the ages of 18-24) who are not in employment, education or training. We as South Africa need WAY more people to be employed to address the unemployment and ever increasing youth unemployment problem in South Africa. We take a look below at an article published on Statistics South Africa (Stats SA's website) following the release of the latest Annual Financial Statistics (AFS) data. The original article can be found here. Some good news in trying times. 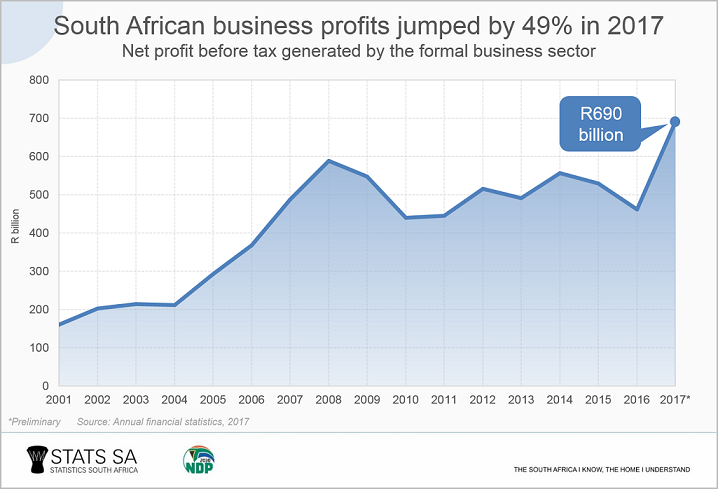 After two consecutive years of decline, South African businesses recorded a 49% increase in net profit before tax in financial 2017, according to Stats SA’s latest Annual financial statistics (AFS) survey. The mining industry was the largest contributor to this rise. The success of a business generally depends on earning a profit. 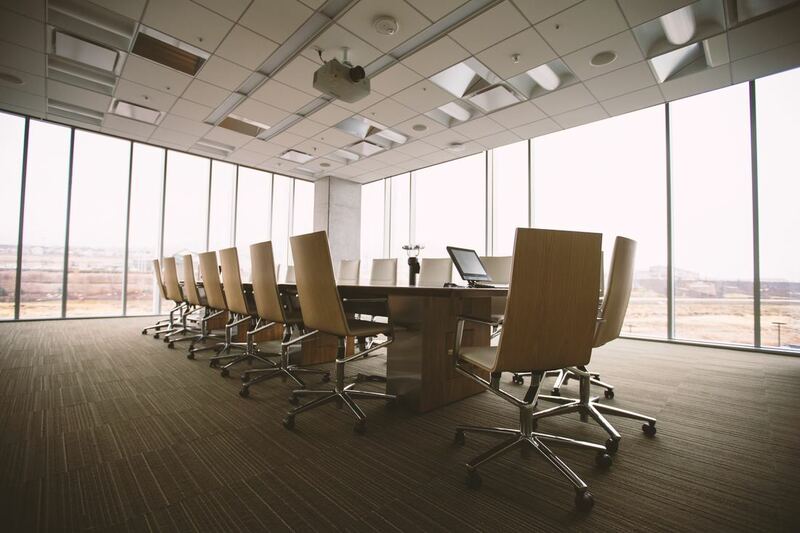 Higher profits provide a company with the ability to expand its business, employ additional staff, and invest in non-current assets (such as buildings and equipment). The South African formal business sector generated R690 billion in profit in financial 2017, R228 billion more than the R462 billon recorded in financial 2016. This increase follows a two-year slump (2015–2016) that saw business profit fall by R95 billion. With the exception of the electricity, gas and water supply industry, all the industries covered in the AFS report saw their profits rise in 2017. The mining industry contributed the most to the R228 billion rise in 2017, increasing its own profits by R80 billion. Manufacturing contributed R69 billion and business services R38 billion. Higher turnover, higher profits on sales of assets and lower losses on revaluation of assets were the main reasons given for the overall rise in profit in 2017. Mining is an important player in the South African economy. The industry contributes 7% to gross domestic product (GDP) and employs around 450 000 people. In the 2015–2016 period, turnover in the mining industry grew by only R24 billion. Falling mineral prices and lower productivity (brought on by electricity shortages and industrial action) contributed to slower growth. The problem of sluggish turnover growth during this period was compounded by higher operating costs. 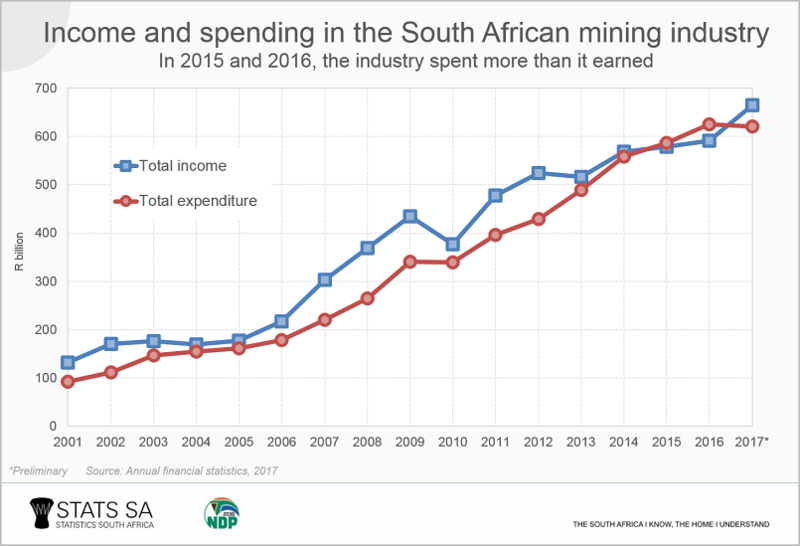 If total income is considered (income includes turnover and other forms of income, such as interest and dividends) the mining industry spent more than it earned in 2015 and 2016. This is in contrast to the 2001–2014 period that saw the industry spending less than the amount of income generated. 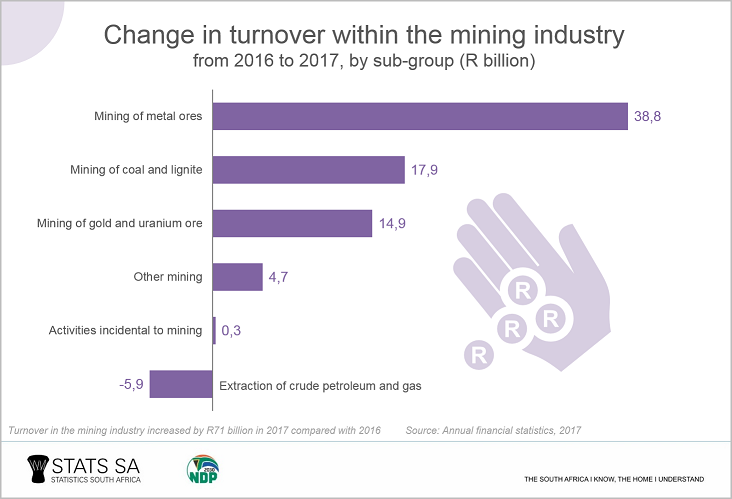 Following 2015 and 2016, the mining industry experienced a sharp rise in income in 2017. This was largely driven by a R71 billion rise in turnover. Mining of metal ores, coal and lignite, gold, and uranium ore sub-groups contributed to the increase. This rise in turnover was the main driver behind the rise in profit. 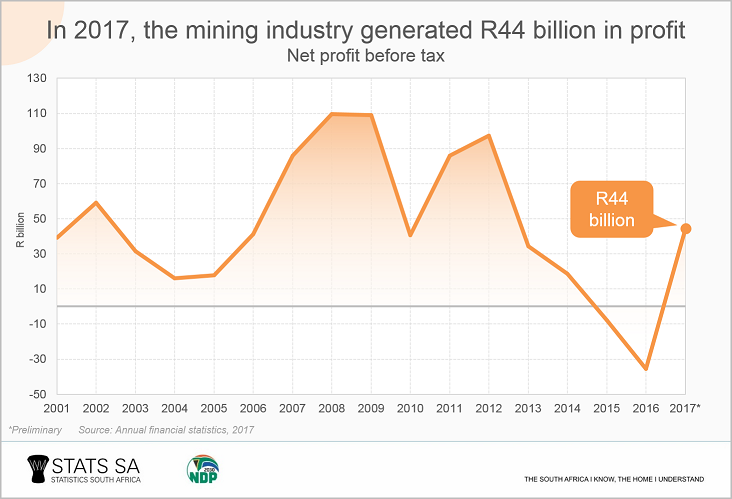 Net profit before tax in the mining industry grew by R80 billion, from a loss of R36 billion in 2016 to a profit of R44 billion in 2017. There was also a slight drop in spending (by 0,8% or R5 billion) in 2017 compared with 2016. The largest decrease in expenditure was seen in losses on revaluation and disposal of assets. A further decrease was seen in the losses on foreign transactions resulting from changes in foreign exchange rates. With the recent announcement by Stats SA that South Africa has emerged from its second economic recession since 1994, all eyes will be on upcoming economic releases to see if there will be more nuggets of good news. Download the latest Annual financial statistics (AFS) release here. 1 Formal business includes private businesses and public corporations. The AFS survey measures the financial performance and position of each industry. The report sources data from the financial statements of enterprises (i.e. private businesses and public corporations) in all industries, with the exclusion of agriculture and hunting; government and educational institutions; and financial intermediation, insurance and business services not elsewhere classified. The AFS 2017 survey information was collected for the financial years of enterprises that ended on any date between 1 July 2016 and 30 June 2017. The bar chart below takes a look at the formal sector employment for the various industries for quarter 1: 2018. During the first quarter of 2018, the formal business sector added 55 990 jobs. Hardly enough to address the near record high unemployment rate experienced in South Africa. And one needs to look at the sectors that added these jobs. So while a lot of formal sector employment jobs were created during the first quarter of 2018, the problem is the major job creator is not the private sector but rather within government (which is the community, social and personal services industry). If government is stripped out, the private sector actually shed jobs during the first quarter of 2018.​ The be exact, without government sector, the private sector shed 11 895 during the first quarter of 2018. And the lack of job creation in the private sector is one of the major problems facing the South African economy and the South African government. As greater employment leads to greater spending (which stimulates growth and brings in additional taxes such as VAT), and greater employment means more personal income tax paid which helps government revenue. The problem is the business sector just doesn't have the confidence in the SA economy to invest and grow in South Africa. We showed this with our BER/RMB business confidence index which showed that for the last 11 years businesses in South Africa thought the business environment is less than ideal. Click here to see that update. In today's update we take a look at the formal sector employment per quarter per industry) for the year of 2017. At the end of the 1st quarter of 2017, formal sector employment was sitting at 9 765 296, while for the 4th quarter of 2017, employment was sitting at 9 778 254, which means that South Africa's formal business sector added just under 13 000 jobs during 2017. Hardly good news for the millions of unemployed South Africans. The graphic below shows the employment per industry for June 2016 and June 2017. From the graphic it is clear which industry is the biggest employer in South Africa. The bar chart above shows that "Community Services" is the biggest employing industry in South Africa. That specific industry is largely made up by government employees. Government employees make up 27% (or 2.58million people) of all employed people in South Africa . And it is no surprise then that compensation of employees makes up the bulk of South Africa's government's spending. See our Fiscal Policy Page for more on government spending. The second biggest employing industry in South Africa is the Business Services industry, with almost 2.2million people. This industry includes security guards, cleaners, maintenance and repair staff etc. The trade industry (wholesale, retail and motor trade) comes in as the 3rd biggest employing industry in South Africa with just over 2million people working in this industry. Electricity industry is the smallest employing industry based on the bar chart above, but with ESKOM running a monopoly in the sector the bulk of those 60 thousand employees work for ESKOM, making it one of the single biggest employers in South Africa. Currently the police service is the biggest employer in South Africa. The image below shows the contribution of various industries to South Africa's formal business turnover for the second quarter of 2017 (April 2017 to June 2017). Note the graphic was obtained from Stats SA. Based on the pie chart above trade (which includes wholesale, retail, motor trade and accommodation) makes up around 36% of total turnover generated by formal businesses in Q2:2017. The manufacturing industry is a distant 2nd place with 27% and business services (security, cleaning, maintenance etc.) and even more distant 3rd place with 12% of total turnover generated. In total formal businesses generated R2.3trillion in turnover during the 2nd quarter of 2017 in South Africa. But simply taking turnover on its own as a measure of commercial success doesn’t provide a complete account. As in all areas of life, costs are inevitable, eroding any turnover that is generated. The two largest expenditure items faced by South African businesses are purchases, taking up 61% of total spending, and employment costs (14%). Other items measured (including interest on debt, hiring of vehicles and machinery, royalties, and renting of buildings) contribute about 10%. The miscellaneous category, referred to as “other expenditure”, is responsible for the remaining amount. After all this spending, including tax and adjustments for inventories, the R2,3 trillion in turnover generated by the South African business sector was whittled down to R256 billion. This is profit earned after tax. Simply knowing how much profit was generated doesn’t provide us with a full indication of business performance. Context is required, and this is achieved by using a handy accounting measure called the profit margin ratio. By comparing two or more financial values where a relationship exists, accounting measures allow the analyst to dig a little deeper into the financial data. The profit margin ratio is calculated by dividing the profit or loss after tax by total sales or turnover. Simply stated, the ratio indicates how much of each rand earned by the industry in turnover is translated into profit. Overall, the South African business sector earned 11 cents of profit for every rand of turnover generated in the second quarter of 2017. As mentioned earlier, trade earned the bulk of total turnover. In terms of profit margin, the industry was ranked fifth in the second quarter of 2017, at 4 cents for every rand of turnover generated. Business services took the top spot as the industry with the highest profit margin ratio, followed by personal services, manufacturing and transport. Construction was in sixth place, with 2 cents of profit for every rand of turnover generated. The electricity, gas and water supply industry, as well as mining, experienced losses, however. For electricity gas and water, it was the third consecutive quarter in which the industry spent more than it earned. See more at StatsSA. As the pie chart shows nearly 60% (or R1.4trillion) of turnover by formal businesses for Q2:2017 were generated by large businesses, with small businesses bringing in 31.3% (or R721billion) and medium sized businesses bringing in 9,3% (or R215billion). The structure of South Africa's economy and business environment is pretty odd, with a small number of large businesses which contributes a lot to turnover generated, while there is a vast number of small businesses, generating almost a 3rd of all turnover in the country. Leaving medium sized businesses in the lurch with them just generating around 10% of turnover. The graphic below shows the employee costs as a percentage of total expenditure per business size. As the chart shows, the smaller the business size the higher the percentage of employee costs to total expenditure is. And this is one of the problem that hamstrings smaller businesses, and will be made even worse with the implementation of minimum wage levels in South Africa.